Sachika Misawa is new for me, because I have never heard anything about her until now, though the first time I heard of her was when I found her PV preview for this song on the general Idol part of Hello! Online's forum, and I quite liked the sound of the song, but quickly put it to the back of my mind after a day or two, so when I saw the single release for this, I immediately picked it up out of many others because it was somewhat recognisable. Well, no wonder... I had seen the PV preview and my mind just told me that I knew what this one was, even after just a few listens. Well, the intrigue has turned into a bit of research, so for those of you who don't know who exactly this girl is, she is Sachika Misawa, borin in 1993 (on the 13th February) and the 2008 winner of the Kadokawa x Up-Front Style Idol Seiyuu Audition 2008 (you read correctly: Up-Front), and so she was added to Up-Front Style before that became defunct due to the departure of the staff and the Idols, and is now under the agency Style Cube, which is also the agency for StylipS and YuiKaori members. 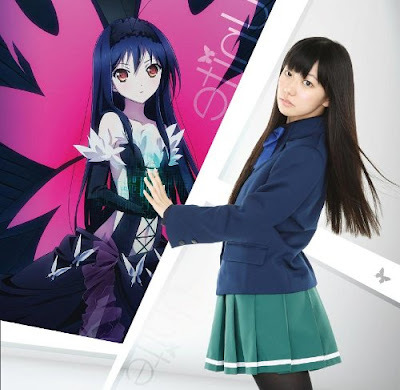 She has also been in a few Seiyuu roles before, such as a few appearences in Kaito Reinya and Yumeiro Patissiere, however she has secured her first main role with the anime Accel World in which she voices the female lead character. This is also the anime where her song, Unite, is used as the ending theme. I'm still a bit surprised that this girl was at one point a part of UFA, because I wasn't actually aware of her until now (well, I doubt she did much in UFA anyway, you know how lazy they can get with their Idols...), but it's good to hear that after UFA she was able to secure herself a main role in an anime (which is apparently quite popular) whilst also scoring herself a single. And that's what we are here to talk about. Now, as far as I know, this is her first single, but for a debut (if this is her debut) this is pretty strong. I have yet to see the PV, but right now I am liking this single a lot. Sachika's voice is strong, and she puts a lot of power into her performance, so for a first impression... this is great. For an A-side, this is pretty awesome. Most of the time, I am used to rather lack-luster A-sides from Idols followed up by epic B-sides, but Unite is different. It's powerful and cool, it has a certain edge to it that other Idols can't really bring in their singles, and considering how powerful and mature Sachika's voice is, it was the perfect choice to give her this song. My first impression when I heard the preview a month or two back was Wow. I loved Sachika's voice, and I really liked the sound of the song, because it was something I don't really listen to, but a song I would indulge myself in every once in a while when I wanted something with a fast pace, something that is that little bit heavier than your regular Idol music, so I'm glad I decided to go back to this single even after forgetting the preview until now, because this is an amazing song. In fact, so amazing that I can't quite believe that it's for an anime. Seriously? It's too good for an Anime! It doesn't have that poppy, generic Anime sound to it that other ending theme's do! It's almost rockish, more so Idol-rock than real rock, but it's so much better than other songs for anime endings I have heard before, which is why it's so surprising that this song is the ending theme for an anime. Then again, I'm surprised that Sachika has a mature and powerful voice for a seiyuu. Usually, most seiyuu's as singers sound adorable, and sometimes annoying. So yeah... surprise. Unite as an A-side is epic in my opinion, and I really like it. I love that Sachika has thrown out the cutesy Idol image and taken on that mature sound to her voice which fits this song so damned well. I love how it's different to any other Anime song I come across, because there is power, emotion and a great singer behind it. Sachika has really blown me away with Unite, because this song is perfect for her mature and powerful vocals. I can't get enoug of it, and now, I want to watch Accel World. Then again... that's what anime songs are meant to do, right? Make you want to watch the actual anime for the song you have suddenly fallen in love with. Twilight is, of course, the B-side to a rather epic A-side on this single, and is a totally different affair to its sister song. It is a lot calmer and has a more gentle feel to it, and shows off that softer side to Sachika's voice, though the maturity and power is still there. I would be lieing if I said that I didn't like this song, because I do like it. Twilight is much softer, and it has a little bit of that Anime-like quality to it unlike Unite, and while I do love the A-side for not having that Anime quality to it, I do like to listen to anime songs now and again, because that is the sound that I listened to for a good five years of my life. This song is reminiscent of my days as an Anime fan, it has that cute sound to it as well as that that gentleness which just draws you in. It's a familiar sound, so of course I'm drawn to it, though I will admit that Twilight is a lot more boring than what Unite is, and I'm pretty sure that I will get sick of it easily. But that doesn't mean that it is bad. It's a very nice song, and I like how Sachika still brings a nice powerful performance with a calmer instrumental. It was nice to hear her calmer side, and I think that she delivered a really nice performance. She has really impressed me here, and I hope to hear more from her. 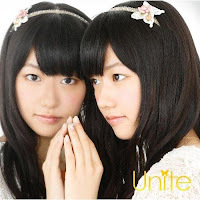 Unite is a strong single release from Sachika, as both songs show off her mature voice perfectly. I love that both songs are polar opposites, showing off that powerful side to Sachika, and then her calmer, more Idol-like side. Both songs are great, and both are memorable, and for a single that was created for the use of an Anime, it's a really strong single. I now have a great impression of Sachika from this single, and I am so glad that I was able to watch that PV preview a while back, because it left a good impression on me then, and I was able to remember it when I found out the single had been released a week or two back. Hopefully, this won't be the end of Sachika's singing career or her career as a Seiyuu, because her talent as a singer will be wasted. Both of the songs are worth the listen, so definitely take a look at Unite and Twilight, and see if they are to your tastes! Now, time to debate whether I want to watch Accel World or not!